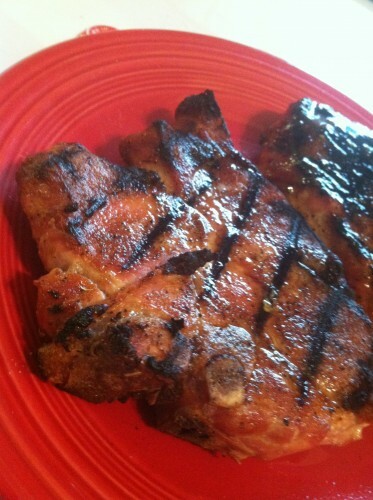 Some rubs and seasonings are geared towards use on one specific cut of meat or one product. Others claim to be all-purpose and usable on just about everything. 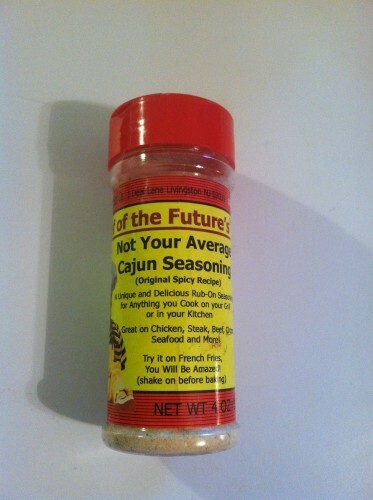 Today’s seasoning is in the all-purpose category and is courtesy of Chef of the Future — Not Your Average Cajun Seasoning. Chef of the Future is the creation of Robert Simon and is based out of Livingston, NJ. Robert got started down the culinary path in his early teens and found inspiration in Graham Kerr, the Galloping Gourmet. His college days were spent helping friends organize cooking feasts. His love of food carried over into his marriage, where he soon took over cooking duties. “To make a short story long….my in-laws became permanent residents of Florida. They asked if I could make up a batch of my Cajun Seasoning and send it down to them. Just being me, I couldn’t send them an old jar of garlic powder with the “Garlic” scratched out, so I used my graphic skills and made up a label, complete with a baby picture of their grandson, slapped on a Chef’s Hat and mustache. Now, what do I call it? Ah ha!!! The Honeymooners…Ralph Kramden…Ed Norton..Chef of the Future! Not being one to take advice lightly, we figured what have we got to lose? That was 3 years ago….. Appearance: Pale yellow, almost white in color, with specks of color dispersed throughout. Texture appears to be very powdery throughout, with spices adding some texture. Aroma: A blend of garlic and onion with just a touch of pepper and lemon. A Taste: Nice salt component. Lemon flavor profile comes through nice, not overpowering at all. Spices blend nicely. Not too hot. I’ve used this product on various food items, ranging from poultry to pork to french fries. Each time I’ve found that while this seasoning will not add any big bold flavors, it will enhance the flavors of any food. My suggestion is to be liberal with using this — more is definitely a good thing. 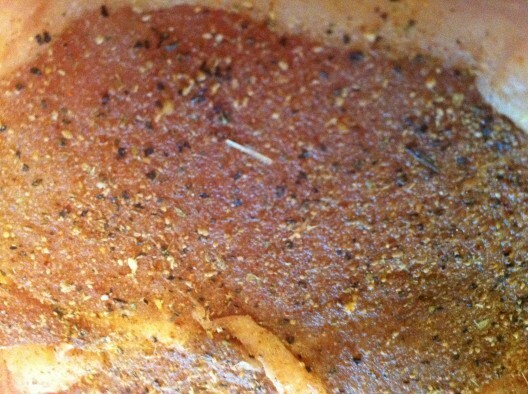 Below is a snapshot of the seasoning applied to pork chops approximately 10 minutes after application. 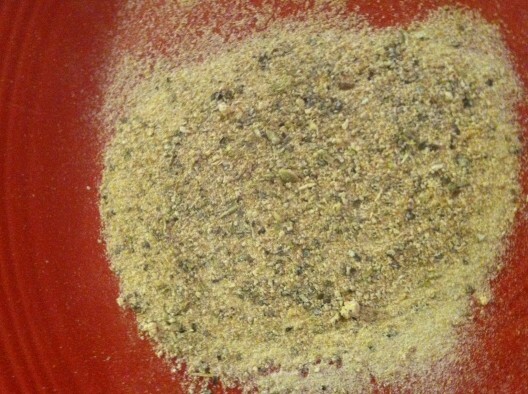 Notice that there is very little trace of the powdery parts of the seasoning. This seasoning won’t add a tremendous amount of color to your meat like a lot of BBQ rubs and seasonings do. However, that does not take anything away from it. My good friend Wilfred Reinke, the Oshawa Ogre, also reviewed this product and notes in his review that even though salt is listed as the first ingredient, the combination of the other ingredients outnumber the salt content. My verdict: this would work nicely as a substitute for seasoned salt. It’s an all-purpose seasoning that is not going to overwhelm you. great review and a great story on this one – Chef of the Future – awesome! Thanks! I found that this particular rub is not one that will impart huge bold flavors. But it will do a very nice job of enhancing whatever you are seasoning. That was one thing that I did not put enough emphasis on — that this really is a low-sodium solution. I was really pleased with that. NYACS, is awesome. I especially love the way it gives my homemade salsa that extra kick. Wonderful on popcorn too.